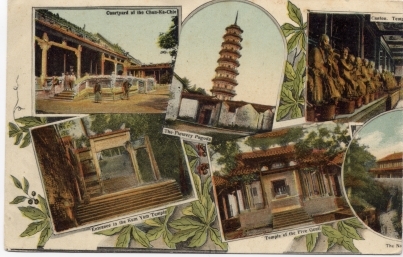 Caption: Courtyard of the Chun-Ka-Chie / Entrance to the Kum Yam Temple / The Flowery Pagoda / Temple of the Five Genii / Canton. Temp[le of the Five Genii] / The No..
Postcard Particulars: Panoramic view of 2 or more cards, left part. Action: Composite of six views of Canton temples with ornate background. The temples are identified. 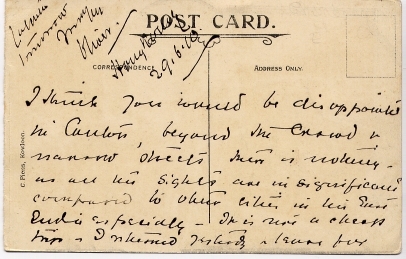 Image Particulars: The original postcard was folded in 2, the right part is missing.